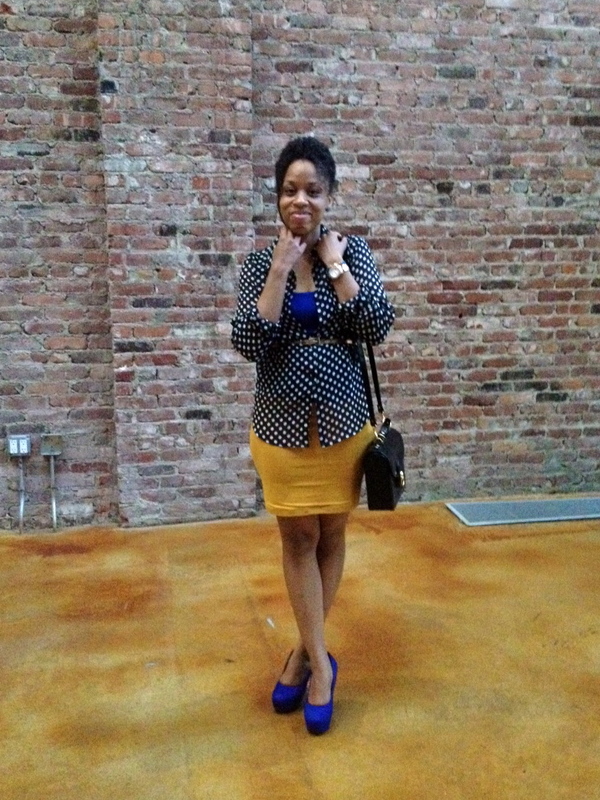 On my experimental journey with color, I am finding that bright colors are not the enemy. Neither are patterns. For the longest time I told myself that I couldn't put these two things together because they would be too bold, too daring. Okay, I didn't really tell myself that, but for a while I was terrified that if I tried it someone would look at me and think what on earth was I wearing. I mean I see people mix color and pattern all the time in magazines, on the streets, that horrible reality TV show I will never admit that I watch and they look fine. The question was though, could I pull it off and feel good about wearing it. So I decided to take the plunge, an experimental quest to search my closet and put an outfit pairing together. Wow! 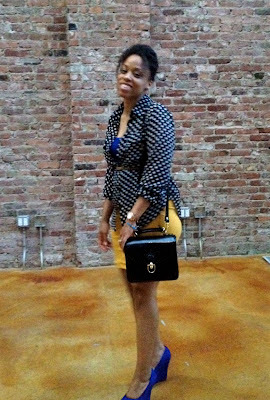 Look at those polka dots pop!! This is looking convincing enough. With my closet inspirations I came up with an outfit that I think any color guru would approve. My creation!! I love it! 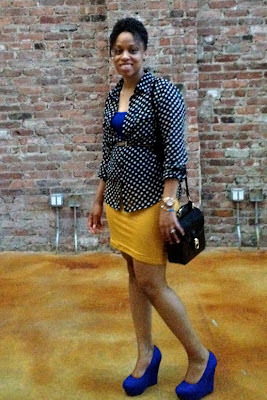 I have been trying to figure out how to wear this mustard skirt for a long time and I think the cobalt blue and polka dots is electrifying with it. 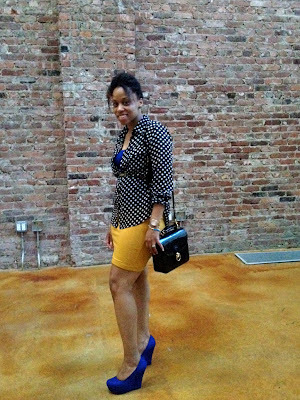 To mesh with the tank I paired my cobalt blue wedges from Payless. 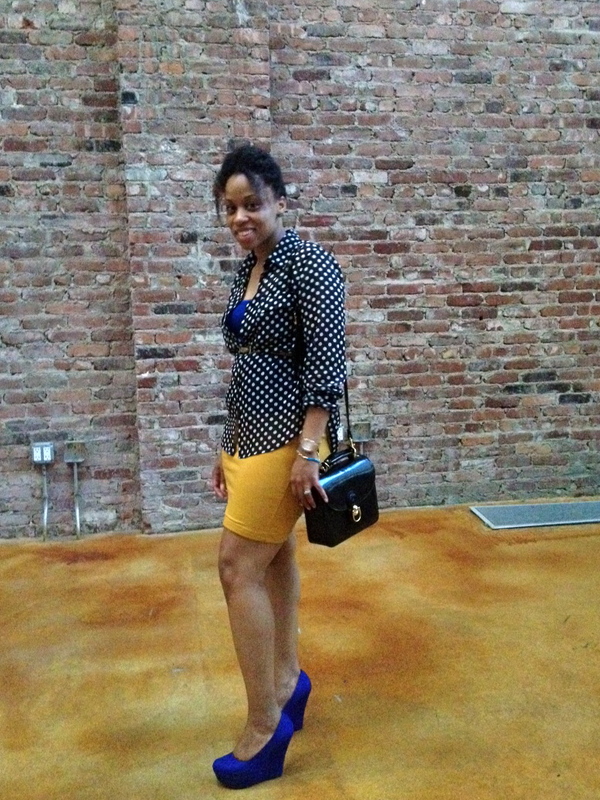 These are the same as my burgundy wedges from the "Brash" collection. They're so comfortable, I can walk in them all day. So what do you think? Polka dots with pops of color? I think I am starting to feel this pattern and color thing. It just may rub off on me...or *POP* out on me. Tee-hee.